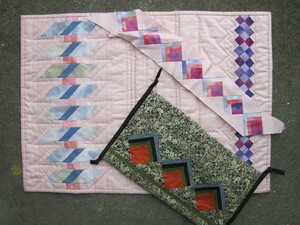 A class where students learn the principles of making Seminole Patchwork bands which can either be used as quilt borders or as decorative patchwork on small items. Christmas ornaments, placemats, small bags, you name it. Seminole Patchwork is a technique developed by Indians living in Florida and they use it mainly in creating distinctive clothing. Since rotary cutters were invented we have been using many of these techniques for speed piecing but the Indians originally tore their cotton cloth to achieve the same accuracy. In a 1-day class one to 3 small items may be started (one or two possibly finished), in a 2-day class more bands would be made for further items or for the decoration of a garment. New Zealand Native Flowers -- In the Wild! This class is loosely based on techniques Ruth McDowell, among others, uses to design blocks based on nature. Rather than using templates however, I will show you how to analyse the structure of flowers and piece them “crazy fashion”. Each block will be slightly different, even though you may be creating the same flower. 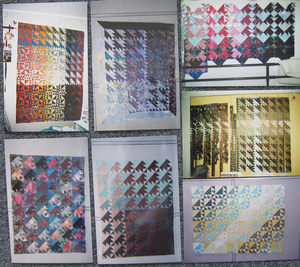 You will also be able to design your “patterns” for use in Foundation Paper Piecing. If you want something a little different and you want to try your hand at a little bit of design, this class is for you. (In theory you could use this technique for hand sewing as well, but it would be slow.) Rotary cutting experience required. 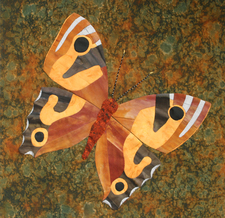 This class is based on the series of NZ Native Butterfly blocks I developed for New Zealand Quilter magazine which ran in issues 64-70. There are six blocks in the quilt but students will choose either the Helm’s Forest Ringlet or Rauparaha’s Copper to do in class. These two blocks between them cover all the techniques used for the six blocks except for the satin stitch embroidery which will be demonstrated. One pattern will be supplied as part of the class. Others will be available to order. English Paper Pieced Hexagons are the rage at the moment and if you are looking for something a bit different using hexagons this class is for you. We will use photos or our surroundings, depending on where the class is held, and gather up some fabrics to create a colour impression of rock pools, a flower garden, you name it! An ideal technique for lazy summer days or while sitting in front of the TV. If you wish to work with shapes other than hexagons the class could be extended to two days in order to spend more time on design. 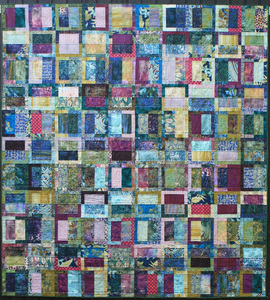 This is a class based on quilts I have been making over the past five or six years. Exploration and experimentation with colour and fabrics of all sorts of styles and designs are the key words for this class. Be prepared to go beyond your comfort zone in combining fabrics and you will make a dramatic quilt. There will be some sharing and swapping of fabrics and I will bring fabrics from which I will cut and sell strips as students desire. I have a formidable collection to choose from! 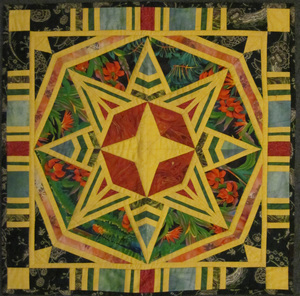 This class is based on the techniques used in my prize-winning quilt, STARNET (QNM:262, p43). Methods of planning a producible lattice will be discussed along with procedures for drawing up a design and drafting accurate templates. Students will construct a small wall-hanging using templates which I will supply for $10 for a set of 7. Each student will need a set. Patterns for these are also available in the book titled Class Act Quilts published by That Patchwork Place in the chapter titled Color Through a Lattice. We will use colouring sheets which will be supplied to try out colour schemes then students will assemble the strip pieced bands from which the templates will be cut. The finished wall hanging will give an impression of looking through an intricate lattice at colours beyond. For intermediate or advanced pupils only. Must have good machine sewing skills, be able to stitch an accurate quarter inch seam consistently and be experienced at rotary cutting. We will plan to do a piece about 60 or 70 cm (24-28 in) square which will contain one large 50 or 60 cm (20-4 in) block plus a border. The slowest pupils will have one quarter of the block assembled by the end of the day, most will have the block competed with the borders to be finished at home. 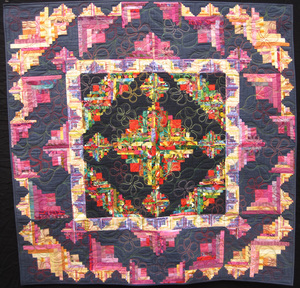 Create a miniature medallion quilt by machine using no templates. Speed piecing techniques will be taught and used. Colour contrasts and blends will be examined. Have the quilt top finished by the end of the day with some idea of the quilt design. For students who feel at home with machine piecing and have some experience in rotary cutting. 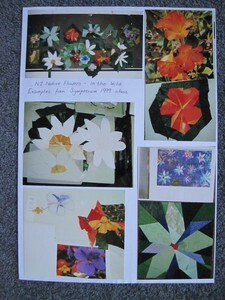 This was written up as an article in Miniature Quilts (USA), April/May 1995, pp10-11, 53, Miniature Medallion Magic. This workshop is based on a series of quilts I have made called African Fabrics. Basic instructions were given in New Zealand Quilter #20, July 1997. That was the first quilt and I have made a number of others over the years since. The workshop will use and extend these instructions, particularly in the use of colours and patterns. Although I have called this series African Fabrics, in fact very few honest African fabrics have been used in the making of these quilts. The point of the workshop will be to create a quilt which looks like the Kente cloth, fabric woven on a very narrow loom and stitched together to make wider cloth. 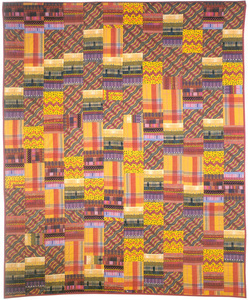 Other ideas for African inspired quilts will also be discussed. You will need a sense of adventure but only basic sewing skills. This workshop is an exploration of "washing" two colour groups of fabrics past each other using a simple triangle block format. Matching or contrasting colour groups may be chosen. The purpose of the workshop is to discover how colours change appearance depending on what they are sitting against. You probably will not complete the sewing but you will do a lot of experimentation and extend your colour sense. You will have the layout complete at the end of the workshop. Some may have begun sewing. You will be working with 6 inch blocks to minimise size and there will be possibilities of a number of arrangements. You will need to make a piece at least 48 by 72 (120 x 180 cm) inches to get any effect. 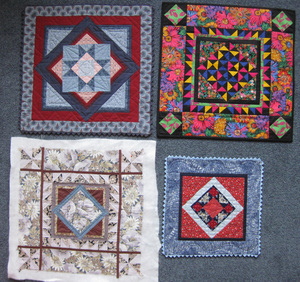 In this class you will learn to combine log cabin blocks of different sizes to create original quilt designs. Using the special grids provided (pack @ $2.00) you will colour in then cut and paste, creating designs which can be either symmetrical or asymmetrical. Various approaches to arranging the blocks will be discussed along with working with both two colour and multicolour designs. 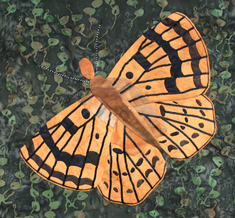 Expect to paste up at least three designs for future quilts. After pasting up several designs you will begin stitching one of them. We will discuss and have demonstrations on the best ways to stitch up various size log cabin blocks very accurately. You will be working with blocks which are ten, seven and a half, five and two and a half inches square (finished). All these sizes will be combined in one quilt so accuracy of the individual blocks is paramount. Must have some experience in machine sewing and rotary cutter use and be able to sew an accurate quarter inch seam consistently. Also, a reasonably large fabric collection will make the quilts more interesting. We may do some sharing of strips.